Indeed, after three months in Hanoi, a shimmering sea of green generally devoid of people was the most exciting prospect I couId imagine. Ah, the pastoral life. But lest you pounce with cries of romanticization, let me add that it was lunch time, so all the farm workers were absent from the fields. In any case, where exactly was ‘there’? I’m not entirely sure. 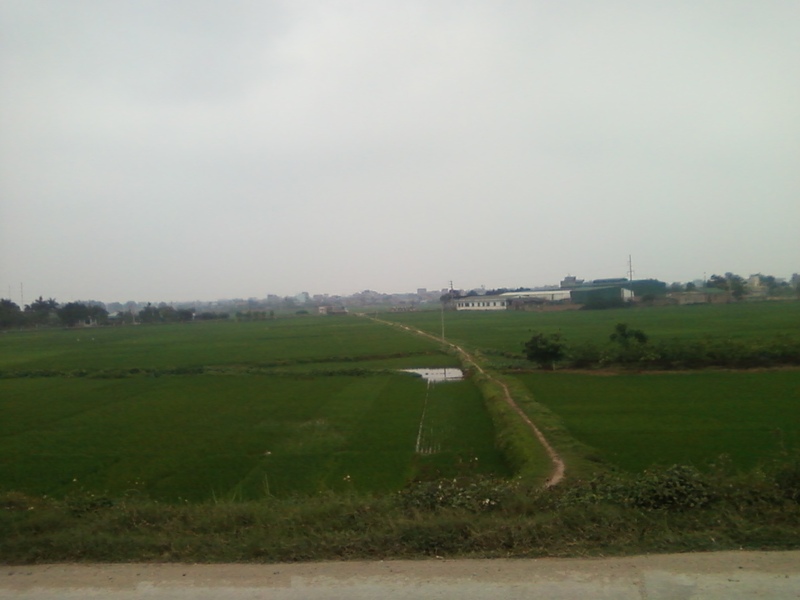 I followed a main road leading out of Ha Dong, a small neighbourhood/town on the cusp of Hanoi, ‘until I saw green’. Glimpses of green between gaps in buildings didn’t count. To the best of my estimates I ended up a good 30km from the outer limits of Hanoi, which, on a motorbike, is a significant enough distance for a mid-afternoon jaunt. I saw many interesting things on my journey, all signs that these towns are inexorably tied to the economic machine that is Hanoi, or vice-versa: the pig carcasses draped over the backs of motorbikes heading into the city; 12-ft. diameter piles of what looked like tar that had dried in the process of oozing out of its proper shape; a pony attached by a leadrope to the back of a motorbike, presumably being taken somewhere to pull a wagon; a live goat whose head poked out of a potato sack so it couldn’t jump off the back of a motorbike, seemingly resigned to its fate or enjoying the view; and men driving BMWs to check on their various business enterprises in the hinterland, or perhaps, more worringly, doing the same as I.
I drove around thinking of William Cronon’s Nature’s Metropolis, which details the reorganization of human and non-human nature in the American west and the interdependence of rural-urban relationships. He writes, “we fool ourselves if we think we can choose between them [the country and the city], for the green lake and the orange cloud are creatures of the same landscape.” So there I was, driving and searching – against my better judgment – for something that can’t possibly exist.